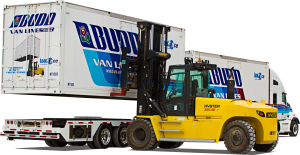 Budd Van Lines was the first time ever recipient of the Global Network 2015 Supplier Innovation Platinum Award for the patented Load it Once Modular Moving System. The award is presented to a supplier that has created a solution demonstrating either significant cost savings and/or increases in service results to Cartus clients. Click on the picture below to view the Load it Once system in action!